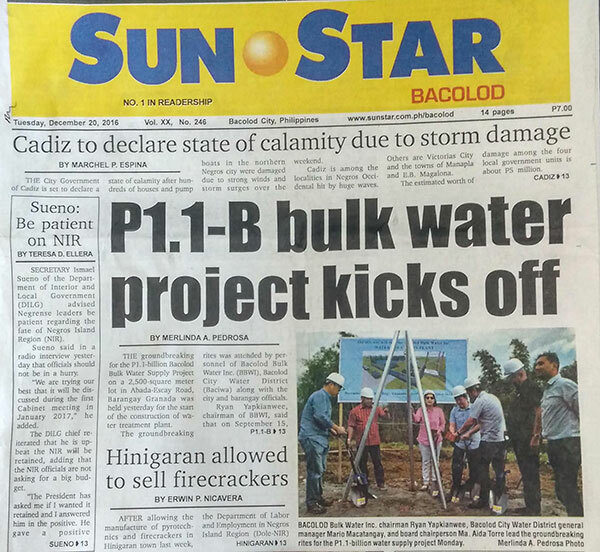 THE groundbreaking for the P1.1-billion Bacolod Bulk Water Supply Project on a 2,500-square meter lot in Abada-Escay Road, Barangay Granada was held Monday for the start of the construction of water treatment plant. The groundbreaking rites was attended by personnel of Bacolod Bulk Water Inc. (BBWI), Bacolod City Water District (Baciwa) along with the city and barangay officials. Ryan Yapkianwee, chairman of BBWI, said that on September 15, 2016, they received a notice to proceed from Baciwa. He said the BBWI will start supplying potable water to Baciwa in the fourth quarter of 2017. "Our combined technologies will be soon be commercially ready to address Bacolod City’s bulk water needs and relieve pressure on Baciwa’s dwindling well water supply," Yapkianwee added. BBWI will use the Ngalan River in Barangay Granada as surface water source. The construction of the water system covers the water treatment plant with an initial capacity of 30,000 cubic meters per day for the two injection points, escalating to 150,000 cubic meters per day through a 20-kilometer long water supply pipeline directly connected to the reservoirs of Baciwa located at Barangays Granada and Mansilingan. Yapkianwee said the project will utilize at least six million cubic meters of water each year from BBWI’s surface water sources. He added that the project will provide immediate access to quality and affordable water to Bacolod residents for a healthier environment, improving sanitation and hygiene conditions. The bulk water project will provide water supply to Baciwa at a blended rate of P9.35 per cubic meter. "The 25-year bulk water supply contract signed on March 22, 2016 between Baciwa and a consortium led by Tubig Pilipinas Group Inc., Mactan Rock Industries, and TVG Builders Inc., formed a special purpose called BBWI to undertake this project," he added. Yapkianwee said they have complied with all the requirements and are securing permits to start the construction. He said at least four surface water sources will be utilized, including three rivers in Injection Point 1, and one river in Injection Point 2. The BBWI is using Baciwa’s water rights permit and after seven years, they will turn over the system to the Baciwa management for free. 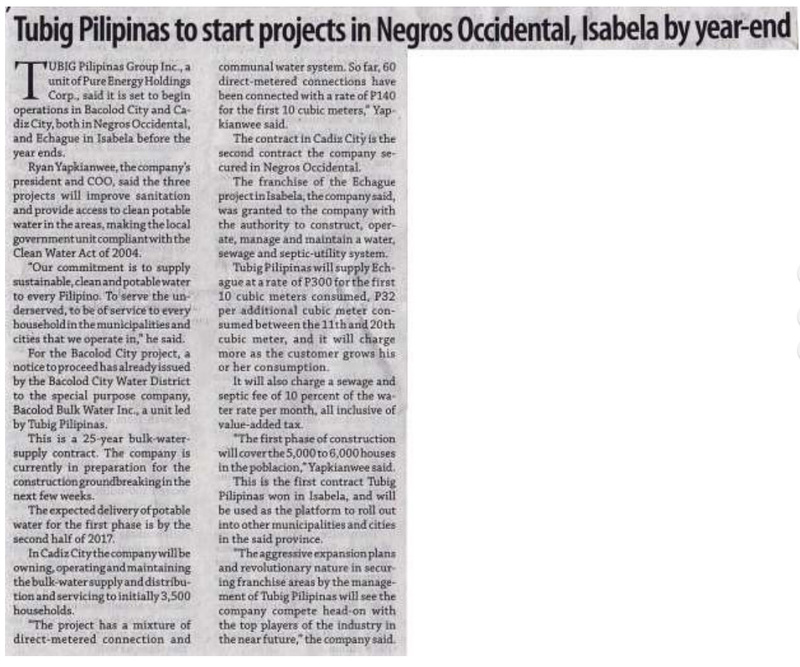 "Hopefully, with this project we will not only be able to supply water shortage, but will also be able to help the new applicants for the new developments in Bacolod," Yapkianwee said. Engineer Mario Macatangay, general manager of Baciwa, said the bulk water project will augment the shortage of water supply in the city. Macatangay admitted that Baciwa is short on water supply by an estimated five million liters per day. "The production of this facility (bulk water project) is 15 million liters per day so by October next year, we hope that we can serve our consumers better," he said. Macatangay said there are areas in Bacolod with only four to six hours of water supply. "This project has been long awaited and we will show to our critics that we are really keen on pursuing our objectives of providing potable water to all consumers of Baciwa," he added. MANILA, Philippines - The team-up of Manila Electric Co. (Meralco) and Repower Energy Development Corp. (REDC) have started works on the P2.7-billion hydropower project in Bukidnon. The partners recently held a ground breaking ceremony for the 10.6-megawatt (MW) run-of-river hydropower project in the Pulanai River. Pure Meridian Hydropower Corp. (PMHC), the joint venture company, will oversee and operate the hydropower project. "This will be PMHC's vanguard project in Mindanao and will serve as a platform to roll out more run-of-river projects in the near future. This is a legacy project that we are building for the benefit of the next generations to come." PMHC president and CEO Dexter Tiu said. During its construction phase, the project will employ more than 400 people. The project, expected to start commissioning by the first half of 2019, will generate millions of pesos in revenues for the local government units as part of their share based on the Renewable Energy Act. 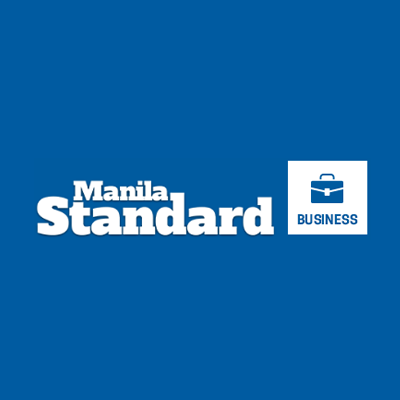 The Pulanai project is Meralco's first foray in renewable energy and in run-of-river mini-hydropower, manifesting its firm support for the development of the renewable energy sector, PMHC chairman and Meralco senior vice president Alfredo Panlilio said. "We are also glad to note that this initiative will provide the much needed additional capacity in the Mindanao grid through a stable, clean and reliable energy source," he said. For REDC, this is its third mini-hydropower groundbreaking for the year, and its first in Mindanao. The company has three operational run-of-river hydropower plants in Laguna that will see its capacities increase more than four-fold by next year. Meralco and REDC forged a partnership in December 2015 to build and develop mini-hydropower plants using run-of-river resources. A hydropower project in Bukidnon that is targetted to generate over 74 gigawatt hours annually through a 10.6 megawatts (MW) run-of-river Hydropower plant in the Pulanai River broke ground on December 9. This joint project of the Manila Electric Co. (Meralco) and Pure Energy Holdings Corporation's subsidiary Repower Energy Development Corporation (REDC) will be built at a cost of P2.7 billion. 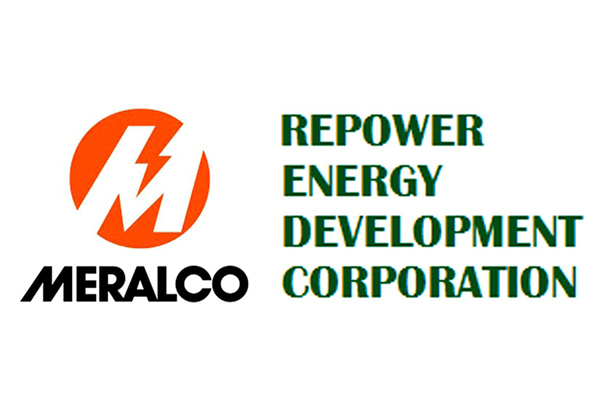 Meralco and REDC have formed a joint venture company, Pure Meridian Hydropower Corporation (PMHC) to oversee and operate the Pulanai Hydropower Project located in Lumbayao, Valencia City, Bukidnon Province. The three hydropower plants that REDC is currently operating was built by the Americans and has been running for 90 years. PMHC officials said that once the the Pulanai hydropower plant becomes operational, it will be able to supply clean, sustainable, and renewable energy to the Mindanao Grid for the next 100 years. "This will be PMHC's vanguard project in Mindanao and will serve as a platform to roll out more run-of-river projects in the near future. This is a legacy project that we are building for the benefit of the next generations." PMHC President/CEO and Pure Energy Holdings Corporation Chairman and CEO Dexter Y. Tiu said. Construction will start soon and the hydropower plants will be commissioned by the first half of 2019. This project will also employ more than 400 people during its construction phase. Once energized, the power plant will also generate millions of pesos in revenues for the local government units as part of its share based on the Renewable Energy Act. "Our investment in Pulanai Mini Hydro is a manifestation of our firm support for the development of the renewable energy sector. We are also glad to note that this initiative will provide the much needed additional capacity in the Mindanao grid through a stable, clean and reliable energy source," PMHC Chairman and Meralco Senior Vice President Alfredo S. Panlilio said. REDC was established in 2013 to address the country's need for additional investments in the renewable energy sector. Its goal was to build and operate more low impact run-of-river hydropower plants all over the country. Meralco is the largest electric distribution company in the Philippines covering 36 cities and 75 municipalities, including Metro Manila. It's franchise area of over 9,337 kms covers the core of the country's industrial, commercial, and population centers serving more than 6 million customers by the end of 2015. It has a market capitalization of US$7.7 billion. The Pulanai Mini Hydropower Projectis the first of several PMHC projects to begin construction.This is Meralco's first foray into renewable energy and in run-of-river mini hydropower. This is its third mini hydropower plant that REDC broke ground this year, and its first in Mindanao.The company has 3 operational run-of-river hydropower plants in Laguna that will see its capacities increase by more than four-fold next year. 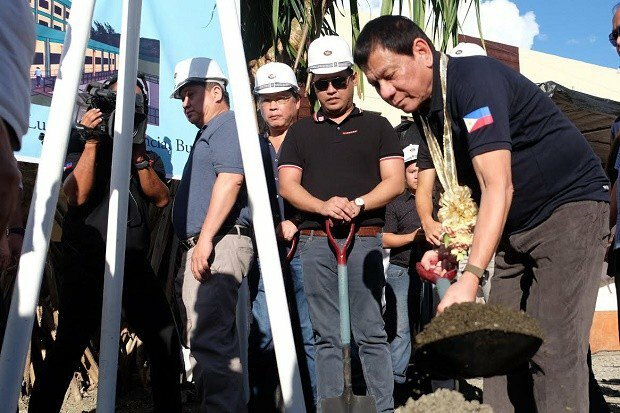 The ground breaking ceremony was graced by President Rodrigo Duterte, Energy Secretary Alfonso Cusi, and Mayor Azucena Huervas of Valencia City. MANILA ELECTRIC Co. (Meralco) and its partner Repower Energy Development Corp. target the first half of 2019 as the start of the commissioning phase of the 10.6-megawatt (MW) run-of-river hydropower plant they are jointly building in Pulanai River, Bukidnon. In a statement, Dexter Y. Tiu, president and chief executive officer of the joint venture company Pure Meridian Hydropower Corp. (PMHC), the P2.7-billion plant is the company's "vanguard project" in Mindanao. It will also serve as a platform to roll out more run-of-river projects, he added. "This is a legacy project that we are building for the benefit of the next generations to come," said Mr. Tiu, who is also chairman and chief executive of Pure Energy Holdings Corp., the parent firm of Repower. The project in Lumbayao, Valencia City in Bukidnon province will employ around 400 people during the construction phase. It is expected to generate more than 74 gigawatt-hours annually from the renewable energy source. It recently broke ground in ceremonies attended by President Rodrigo R. Duterte and Energy Secretary Alfonso G. Cusi. PMHC Chairman Alfredo S. Panlilio said the project "is a manifestation of our firm support for the development of the renewable energy sector." "We are also glad to note that this initiative will provide the much needed additional capacity in the Mindanao grid through a stable, clean and reliable energy source," said Mr. Panlilio, who is also Meralco senior vice-president. Repower has three hydropower plants, which were built by the Americans, are 90 years old and still running, PMHC said. Once operational, the Pulanai hydropower plant will be able to supply clean, sustainable and renewable energy to the Mindanao grid for the next 100 years, it added. The Pulanai plant is the first of several PMHC's projects to begin construction. It is Repower's third mini-hydropower groundbreaking for the year, and its first in Mindanao. Meralco is the country's largest electric distribution company. It serves more than 6 million customers in 75 towns and 36 cities, including Metro Manila. The project is Meralco's first venture in run-of-river mini hydropower. Meralco's controlling stakeholder, Beacon Electric Asset Holdings, Inc., is partly owned by PLDT Inc. Hastings Holdings, Inc., a unit of PLDT Beneficial Trust Fund subsidiary MediaQuest Holdings, Inc., has an interest in BusinessWorld through the Philippine Star Group, which it controls. President Rodrigo Duterte has asked the New People’s Army (NPA) to stop attacking and damaging energy and communication facilities, citing their propensity to burn equipment of companies who refuse to pay revolutionary tax. "Ang style kasi ng NPA, pag hindi niyo naibigay, sunugin (NPA's style is if they don’t get what they want, they’ll burn [the facility]). Hoy. Makinig kayo ha. Huwag ninyong pakialaman 'yung sa tao (Hey! Listen. Don't mess with the [facilities] for the people). Energy, communication, everything. Lay off, lay off," Duterte during the inauguration of the 10.6-megawatt Pulanai hydroelectric power plant in Bukidnon. The NPA, the armed wing of the Communist Party of the Philippines (CPP) has bombed and torched different facilities in the country as retaliation to firms who do not pay revolutionary tax. The Philippine government and the communist rebel are currently on a ceasefire agreement as both sides pursue the peace talks. The National Democratic Front (NDF) has demanded the release of over a hundred political prisoners but Duterte has rejected their demand. The President said he wanted the both parties to sign an indefinite bilateral ceasefire. "You're asking or demanding the release of 120 political prisoners. I denied it. I declined to do it because I have given so much too soon. Sabi ko sa kanila (I told them), produce to me a document which is that you have agreed to an indefinite ceasefire," Duterte said. Political prisoners, NDF consultants and human rights advocates are on a hunger strike to demand from Duterte the release of political prisoners. 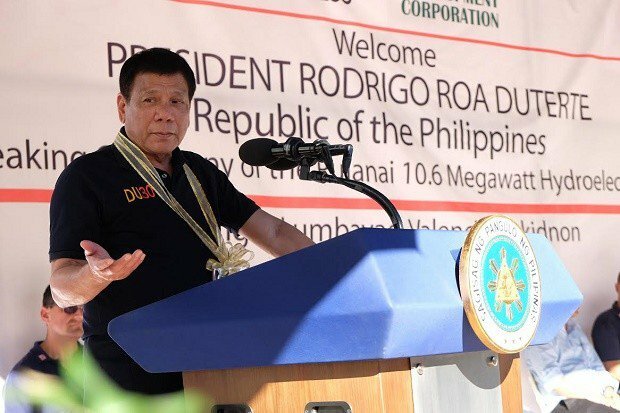 On December 9, 2016 President Rodrigo Duterte led the groundbreaking Pure Meridian Hydropower Corporation's Pulanai10.6 Megawatt Hydropower Plant located in Valencia City, Bukidnon. The Plant will be operational by the first quarter of 2016 and will be supplying clean, renewable energy to the Mindanao Grid. - Duterte questions source of $10 billion "green fund"
Tubig Pilipinas Group Inc., a subsidiary of Pure Energy Holdings Corp., said it is set to begin operations in Bacolod City and Cadiz City, both in Negros Occidental and Echague town in Isabela before the end of the year. Tubig Pilipinas president and chief operations officer Ryan Yapkianwee said the projects would improve sanitation and provide access to clean potable water in the areas, making the LGUs compliant to the Clean Water Act of 2004. He said for the Bacolod City project, a notice to proceed was issued by the Bacolod City Water District to the Bacolod Bulk Water Inc., which is led by Tubig Pilipinas. In Cadiz City, Tubig Pilipinas will own, operate and maintain a bulk water supply project which will serve 3,500 households. Tubig Pilipinas said that in Echague, the company was granted the franchise and authority to construct, operate, manage and maintain a water, sewage and septic utility system.